An Irishman, a Pole, a Russian and a Frenchman are all in a room. What language do they speak? This isn’t a riddle or a joke but what happened to me last week. You see I’m just back from spending eight days in the town of Nitra in Slovakia where I participated in the Somera Esperanto Studado (Summer Esperanto Study). So what is Esperanto like in practice? 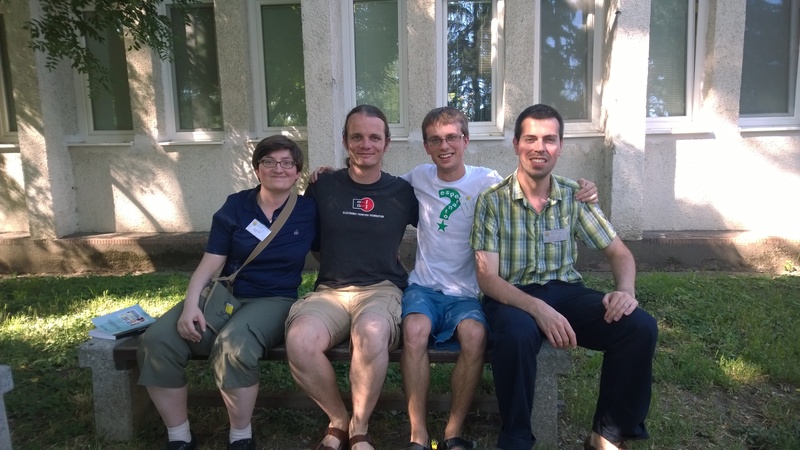 What is the Esperanto community like, what do Esperantists do when they meet and how does Esperanto function as a language? I’ve discussed Esperanto twice before on the blog and have been properly studying it for the last five months. However, because the Esperanto community is so dispersed, I had almost no actual practice speaking it. So although my level of reading was decent, I struggled to string a few sentences together when I first arrived. Plus I was nervous about the fact that I knew absolutely no one who would be there and had never been to Slovakia before. This was my first introduction to the world of Esperanto so I didn’t know what to expect. SES is basically the same as the Gaelthact but in Esperanto. Every morning we would have four hours of classroom study based on our ability (I was B1). In the afternoon there was a host of talks on various topics, games, dance lessons and general free time. In the evening there would be a concert by an Esperanto artist (though the first night we had a concert in traditional Slovakian music which was surprisingly similar to Irish music). We were all staying in college dorms and had our meals in the communal canteen (which was where I got to know everyone). There were also trips and excursions to nearby towns and historical areas. The first thing I noticed was how confident and natural the organisers were in their speech. On my first day I was blown away by advanced speakers rattling off Esperanto as rapidly as their native tongue. If anyone has any doubts as to whether Esperanto is a “real” language that properly functions, then I can tell you it certainly does. Conversations flowed as easily as a natural language and not as some hodgepodge that some people have the misconception of Esperanto as. 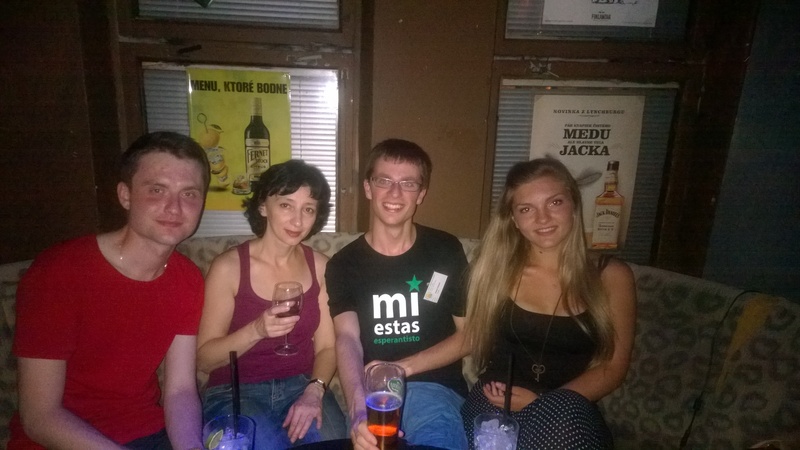 It seemed perfectly normal for me to chat with friends, ask questions or discuss politics over a beer in Esperanto. 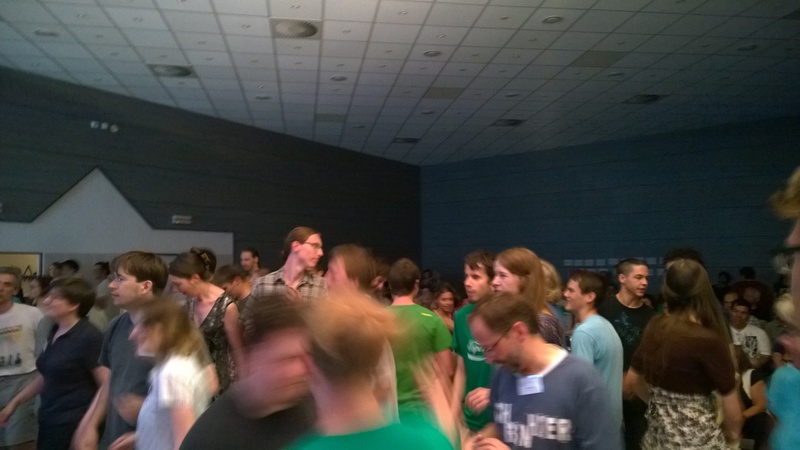 What was also noticeable was how relaxed everyone was in their Esperanto. There was no need for speeches promoting Esperanto, no propaganda, no flag waving and I never even heard the Esperanto anthem. This wasn’t a political rally but just friends enjoying themselves. Esperanto is more than just a language, it is also a culture. There were plenty of unique games and words such as krokodili, to speak your native language instead of Esperanto (which I am proud to say I rarely did). I got to meet denaskulo, people who speak Esperanto from birth. There were games like aligatejo, where you can’t speak either your native language or Esperanto. The Bamba is a popular song but there is also a game where a group of people link arms and dance in a circle around other dancers. Those in the circle then choose someone in the outside circle who they kiss and switch places with. There was also table tennis, card games, juggling lessons, dances classes (in the tango and swing among others), ukulele classes, singing and going to the bar. Esperantists like to party as much as the rest of us, but there was also the gufuejo, a mellow place open after the concerts where you could drink tea and peacefully chat with friends maybe while listening to relaxing music. Esperantujo is also very open to other cultures (particularly minority ones) and for the international evening (where people gave a display of their native culture) I sang two songs in Irish (the only time in my life I’ve had the nerve to sing onstage). I had an amazing time. I’ll admit the first day or two were rough, when I couldn’t understand what people were saying and didn’t know anyone, but I soon realised that everyone was in the same boat. It was incredibly easy to make friends and I made some great ones. By the third day I was comfortable and used to speaking Esperanto and all I had to do was sit beside someone at a meal to become friends. There was an amazing mix of people from children, teenagers, students, parents, to the elderly and even a dog. There was more than 250 people from 28 countries and such was the level of mixing that it was rare to find many people from the same country in any group (the Russians and Germans being the exception). In fact advanced speakers don’t have much of an accent so it wasn’t obvious where they came from, which after all, didn’t matter. I did notice one thing about learning styles. At first I was placed in a class that strongly reminded me of being in secondary school. The teacher discussed grammer rules on the board while we sat in silence and took notes. On the second day I changed to a different teacher (at the same level). She didn’t have a blackboard but would instead simply talk to us and have us talking the whole time. While I didn’t take any notes, instead I became much more comfortable with the language. Grammar rules and vocabulary lists can be done anytime, actual speech and confidence was something I needed much more work on. I think this is a lesson for how we teach languages in general. To much emphasis is placed on grammar and doing things exactly right and not enough on getting students engaged with the language and actually using it. I had such a great time that I was actually very sad and lonely after I left (and still am a bit now). It still feels a bit strange to be speaking and writing in English now. I was so engrossed in Esperanto that returning to Ireland was like returning to a life I forgot I had. In fact it got to the point where I was automatically translating my thoughts into Esperanto. I miss the constant buzz and activity and always being around friends. I now truly feel like an Esperantist and am already looking at flights to Germany for JES at New Years. Ĝis la revido! I remember studying about it in secondary and thinking what a fantastic idea. Short of space exploration, is there not a more pressing endeavour for humans to pursue but a shared language? You should give learning it a try, its actually really easy. As its a constructed language, there’s no irregular grammar, instead everything is simple and logical. There are a few things which are not simple or logical. The numbers are 1 – 10, 100 and 1000. 12 is ten-two, 20 is two-ten, 2,222 is two-thousand two-hundred two-ten two. etc. Thus up to 999,999 it is quite sensible – ten apples, six thousand apples, but once you get to a million, you say things like “two millionS OF apples”. Another mess is the names of countries. Traditionally there are two types of countries. One group is countries like France, Germany or Italy which are named after the race which inhabits them, so Franc-ujo is the country inhabited by Franc-oj, German-ujo is the country inhabited by German-oj, Ital-ujo is the country inhabited by Ital-oj, and the adjectives are franc-a, german-a and ital-a. The second group of countries have their own names, such as Australi-o, or Tunizi-o. The inhabitants of Australi-o are Australi-anoj, and of Tunizi-o are tunizi-anoj. The adjectives are australi-a, and tunizi-a. A bit of a mess, but manageable. Then some bright spark decided to say Francio instead of Francujo, Germanio instead of Germanujo, etc, etc, etc. So now when you come across a country called Bolivio, you don’t know whether the root is really Bolivi- or Boliv-, and thus don’t know whether the adjective is Bolivi-a or boliv-a, or whether the people who live there are boliv-oj, or bolivi-anoj. Then there is the problem of tools. Normally, if you sew [kudri] you do it with a “sewing implement” – kudrilo. If you cut [tranĉi], you do it with a “cutting implement” – tranĉilo. If you do the ironing, [gladi], you do it with an “ironing implement” – gladilo. So what you think you use if you want to hammer? To hammer is marteli, so you’ expect to use a “hammering tool” – martelilo, but no, it’s just martelo. Not simple, not logical, not without exceptions and not completely regular. May be you have learned a bit of Esperanto but you have not understood the essence of the language. I am not writing to dispute against you but to only make things clear. 1) The root “martel-” has a noun character and by definition it is a tool, ie. “martel-o” is the fundamental word, which is a noun. The verb “martel-i” is derived from that noun character root. 2) On the other hand the root “kudr-” has a verb characrter, ie. the root “kudr-i” is fundamental and is a verb. The tool from that root has to be formed as “kudr-ilo”. 3) Finally the root “blu-” is of adjective character, ie. “blu-a” is the fundamental form, and “blu-o” or “blu-i” are the noun and verb forms derive from that character. In this case if there was to be a tool, it would be “blu-ilo”. This feature may be difficult for some who do not have understood the essence of the language. And difficulties exists in the learning of any language. Zamenhof designed the language very close to the Latin or Romance based languages. He didn’t want to make it a completely different one. And that is the secret it has been accepted so widely. I myself have stumbled upon many other difficulties. One difficulty is using the accusative (“akuzativo”) which is the first difficulty all learners encounter, but the most easy to overcome. Then it is the transitivity concept of verbs (“transitiveco”), which is available in almost all languages as well as in English. This again depends on the character of the verbs. So one has to learn which verb is transitive and which one is not. Furthermore this feature is not the same in all languages. As for the country names, yes, that’s a discussion, but it doesn’t become an obstacle to learn the language at all. Think of all those “-istan” finishing land names, isn’t it the same as the “-ujo” prefix in Esperanto ? Ex: Kazakhstan, Afghanistan, Tajikistan etc. Finally, if I was going to design a language I would surely implement it in a different way. But this is the best so far implemented and widely accepted designed language. According to me it is a state of art. And think that it has been spread on the world in the late 1800’s where there was no internet and people were facing many barriers and impossibilities. Someone who speaks English or French or Spanish etc can learn the language in 48 hours and this is my own pretension. For this, one has to buy the “Esperanto by direct method” book of Stano Marĉek, which is ~€10 and available in more than 25 different languages. The book has 22 lessons of 4-6 pages each, and for each of them one needs ~ 2 hours to study. So in 22 x 2 = 44 hours one definitely becomes an “Esperantisto”. Learn Esperanto in 48 hours? What rubbish. You may be able to parrot most of the fundamento, but you certainly will not be a fluent speaker. Mi tuj jesas, kiam oni diras, ke Esperanto estas tre bela, tre ulita interpopola komunikilo. La proponon, ke ĝi estu ĉies dua lingvo, jesas mi ankaû. Sed oni agnosku, ke ĝi ne estas perfektaĵo,kaj ke ĝi enhavas kelkajn senlogikecojn kaj malregulecojn. I’m no fan of those who oversell Esperanto’s ease, but you can pick up the basics very quickly. Plus I use Esperanto Land in English and Esperantujo in Esperanto. Nenio estas perfektaĵo. Mi pensas ni samopinias pli ol ne. Mi kredas, ke tiaj ekzemploj kiel “broso/kombilo”, “martelo/segilo” estas neeviteblaj en ĉiu ajn lingvo, ĉar ni homoj fojfoje vidas ilojn kiel ĉefajn aferojn, kaj fojfoje vidas aĵojn kiel ĉefajn aferojn, (kaj fojfoje landojn ĉefe, fojfoje ppolojn ĉefe, kaj tiel plu). Des pli, ke la mondo kaj socio kaj niaj scioj kaj sintenoj pri aferoj daŭre evoluas. Ne estas iu simpla natura objektiva maniero konsekvence kategoriigi kaj klasifiki la universon, bedaŭrinde. Do arbitre ni faras. PS: Pri nombroj: evidente ne eblas daŭrigi la sistemon “dek”, “cent”, “mil” arbitre longe (tio postulus kreadon de nefina kvanto de numer-radikaj vortetoj), do la numera sistemo estas evidenta kompromiso por fari “normalajn” ĉiutagajn numerojn facilaj/simplaj. Alternativo estus ekzemple simple diri la individuajn ciferojn (“100” = “unu nul nul”), kio estus ĝena en plejmultaj ordinaraj situacioj. En la fino, la celo de Esperanto NE estas esti pure logika rigida lingvo (por tio, oni havas ekzemple Lojban), sed esti uzebla facila lingvo kiu bone funkcias por homoj en ordinaraj situacioj. Bonvolu aĉeti la libron kaj provu instrui kelkajn komencantojn. Certe ke ĉio dependas je la kapablo de la lernanto. Tiu libro instruas la lingvon en 22 lecionoj, tre metode kaj tre klare, kaj laŭ mi iu angla aŭ/kaj franca parolanto povas lerni ĉiun lecionon je preskaŭ malpli ol du horojn. Mi pensas ke la vortprovizo lernita de tiu libro estas preskaŭ la tuta listo de la zagreba metodo. Mi ankaŭ taksas min kiel komencanto, ankaŭ post la du jaroj kiam mi komencis lerni la lingvon, kaj mi ĉiam taksos min tiel, ĉar lernado de lingvo neniam ĉesas. Sed mi havas la tempon kaj provas legi librojn. Mi ankaŭ partoprenas je la Sumoo organizo en kiu oni legas librojn kune kun multe da aliaj Esperantistoj tutmonde ses foje dum la jaro. Jes vi pravas, Esperantujo ja estas plenplena kun “ĉiamaj komencantoj”, sed ĉu tio malaltigas la valoron de la lingvo? Kaj bonvolu diru al mi kiom da “eternaj komencantoj” ekzistas en la angla-lando aŭ anglujo ? Mi scias ke preskaŭ ĉie en la mondo en ĉiuj lernejoj la angla lingvo ja estas instruita al la lernantoj. Ili eble lernas la anglan lingvon dum pli ol ses jaroj kaj preskaŭ neniu lernas ĝin kaj povas paroli la lingvon poste. Sed post la 22 lecionoj en mia menciita libro oni ja povas paroli la ĉiutagan kaj simplan Esperanton. To be honest a lot of that is nit picking. I’m sure if you dig deep enough you can find something that is not perfectly logical, but all you prove is that Esperanto is only 99.9% logical, which frankly, is good enough for me. I’m not quite sure what your problem with the numbers are, other than using a plural for million, which doesn’t seem insurmountable. The country names system isn’t great but have you seen country names in Irish? That is a mess, yet it would be silly to say I dislike Irish because of the way countries are named. ̂Ĉu la irlanda lingvo fanfarone asertas, ke ĝi estas regula, logika, ktp? Ne, sed 99% logika sufiĉas bona por mi. Ne komparas Esperanto kun via ideala perfekta lingvo ĉar nenio sufiĉos bona. Mi nur komparas kun la alia lingvo ni havas. My wife used to go to these Esperanto seminars years ago. Did she pick up much of the language? What did she think of it? saluton el Slovakio, mi tre ĝuis vian kantadon, ĉar mi ege ŝatas keltan muzikon, dankegon pro via kontribuo kaj ĝis la revido iam kaj ie en Esperantujo, via hejmlando! Saluton Robert, I am 55. This year on April I have been at the “7a Mezorienta Kunveno” in Georgia, for the first time in an Esperanto meeting, where I met many Esperantists (around 60 from more than 10 countries) and I also made friends. I want to admit that I am sharing your feelings exactly as you have described them. I am learning Esperanto for two years now, and I believe I am somewhere around B2 level. I also want to participate SES and I cannot hold myself for this. May be next year if it’ll be possible. I suggest you to publish this text in a few other blogs or web papers and magazines, and also if you can translate it to Esperanto, submit it to different “Esperanto revuoj” / magazines on the web. I enjoyed reading your description of SES. I recently participated in NASK (Nord-Amerika Somera Kursaro) a similar event in North America. I also found it helped a lot in developing conversational skills, as distinct from typing email messages. Very good post. One point that sometimes people fail to grasp: even though Esperanto could well serve as a common second language, that would NOT mean that people would discontinue learning other languages. As you point out, languages are part of a culture, and someone who admires and wants to know more about French, Italian, Japanese, etc., culture will certainly want to learn the culture’s language as a part of studying the culture. The difference would be that people would be learning other national languages because of their interest in the culture, not simply to be able to communicate: Esperanto would fill that need. Previous Previous post: What Is Capitalism And Socialism?